The S.M4 is an array of four dipoles mounted on an aluminium mast. Each folded dipole balun assembly and harness junction is completely encapsulated in epoxy resin, totally preventing moisture ingress. The balun assembly has been tested to BS5490:IP67. The S.M4 offset array is used extensively in UHF and VHF Trunking systems. 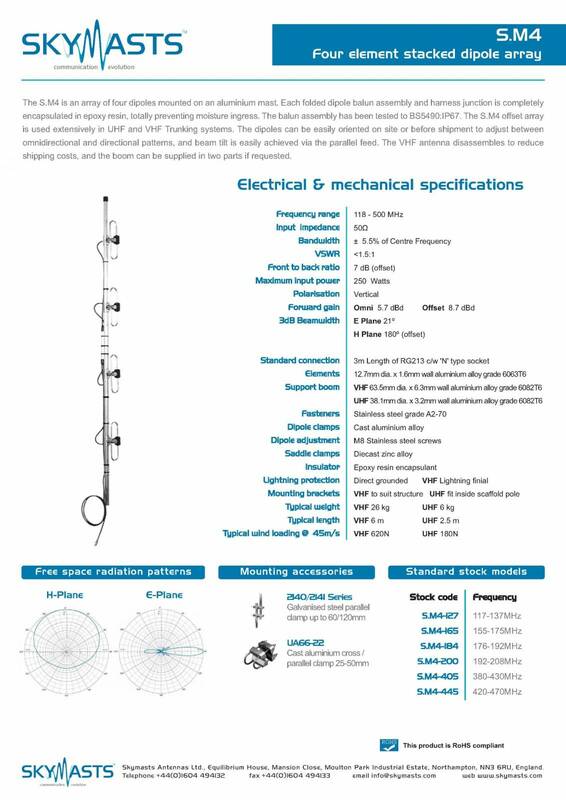 The dipoles can be easily oriented on site or before shipment to adjust between omnidirectional and directional patterns, and beam tilt is easily achieved via the parallel feed. The VHF antenna disassembles to reduce shipping costs, and the boom can be supplied in two parts if requested.